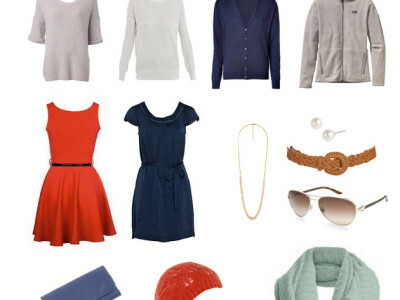 Now that I’ve culled my clothing down to things that I actually really like, it’s much more in my interests to extend the longevity of each item. Being somewhat clumsy with food and calligraphy ink, I sometimes end up with clothes that are perfect except for a not-quite-removed stain, especially on the light coloured ones. The solution I’ve come up with isn’t an original one – I just dye them a darker colour. Since I’ve discovered that pale colours aren’t really my thing anyway, this often ends up making me like my ‘new’ clothes better anyway. The process is quite straightforward – I used Dylon fabric dye in dark green, along with warm water and a lot of salt. I then stirred my clothes in it for 15 minutes, then every 15 minutes with one gloved hand, whilst watching Orphan Black on my iPad with the other. By the end of the episode it was ready to wash and set out to dry. Above you can see a before and after, and how the different shades and fabrics turned out, although I didn’t have the foresight to put them in the same order. 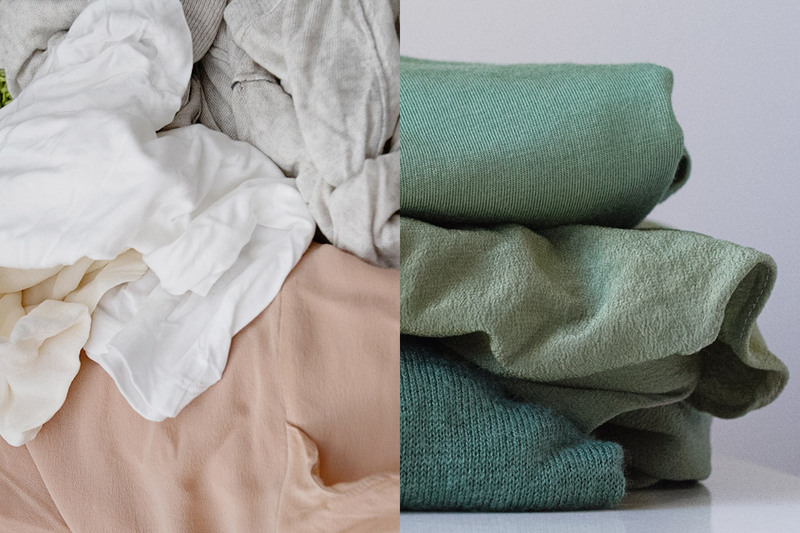 My Lululemon bamboo/cashmere blend sweater (top in the left pic; bottom in the right) started out a pale grey, and ended up a slightly paler version of the suggested colour. 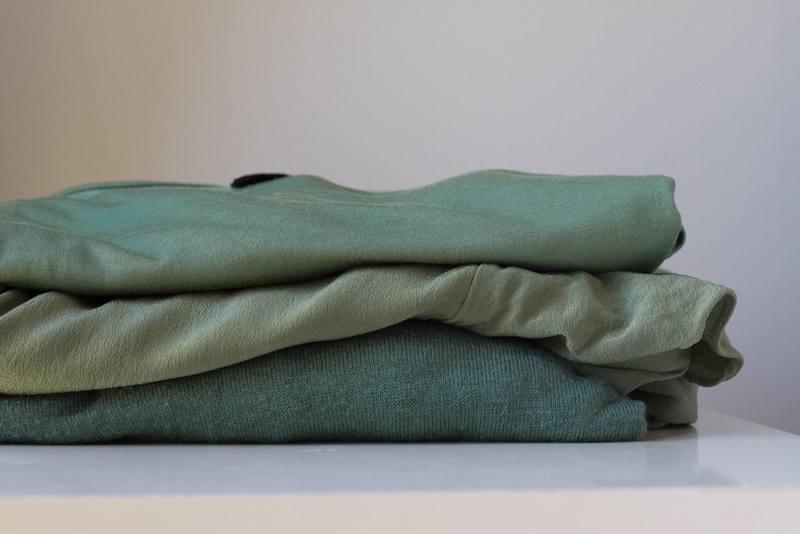 My modal and silk t-shirt (middle in the left pic; top in the right) went from white to a slightly paler forest green, and both the silk and modal portions ended up a very similar colour. Lastly a dusky pink silk dress (bottom in the left pic; middle on the right) ended up a lovely olive green, although the polyester lining remained dusky pink! Technically I dyed more clothes in one batch than suggested, but I’m happy with the resulting medium tone rather than the darker green, for now at least. And of course it covered up those stains. All of these items had been sitting in the ‘to be fixed’ pile for months before I got around to dyeing them, and now they’re back into regular rotation. 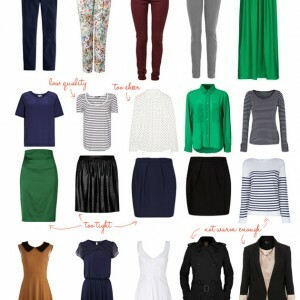 I can also see this as being a simple and cheap way to breathe a bit of life into a capsule wardrobe without having to buy something completely new. Pay attention to the fabric – synthetic fabrics do not hold dye (trust me, I’ve tried it before) unless it’s done in a special way. I believe cotton will take dye better than the fabrics I used this time. Remember that synthetic trims, thread or lining won’t take the dye, so you might end up with contrast stitching that you weren’t after! If you’re dyeing something that already has a colour, think about how those colours will combine (for example, my dress ended up more olive than the packet suggested due to the pink). The more items you throw in to dye, the lighter the overall colour is going to be. To get a similar colour to the packet, weigh your clothing first and stick to the instructions. What matters is which dye. Some are for cellulose fibers (cotton, linen, hemp and usually rayon although it breaks differently), some are for protein fibers (wool, silk and silk usually needs steam setting), and some are for acrylic fibers. How the dye is set also matters in color saturation. Steam, heat, time or some combo of the three. Thanks, that’s really helpful! I kind of wish I’d gotten a slightly darker colour on some of these pieces, but I suppose it’s a learning process.